Arcade gaming is a multi-million dollar industry. Each year, hordes and hordes of players flock to a variety of arcade-style games, looking to test their luck and skill in exchange for a prize and, even more importantly, bragging rights. Most of these games are fairly easy and straightforward, but there are some that are stacked heavily in favor of the house, making them hard to tackle to say the least. At the end of this “difficult” spectrum are the arcade claw machine games, in which hopeful individuals risk their hard-earned money for a chance to snag a stuffed animal (or some other a toy) using a mechanical grabbing device or claw. Although arcade claw machines sound simple enough, what many don’t know is the odds are stacked against them the moment their coins—or dollars or tokens—go into the slot. Because of this, many a sane person has been known to spend dozens of dollars to prove their stuffed-animal-grabbing acumen, and when they finally do succeed they realize they have just spent $20 for a $2 stuffed octopus. To help you avoid this embarrassing and demoralizing fate, below we have provided some genuine, sure-fire tips for winning at arcade claw machine games, with tactics and secrets honed from the makers and operators of these often deceptive games. Like arcade-style games, playing the claw machine game means taking a risk. All of these games of chance are, by definition, a gamble, but you can help to increase your odds of success with a little knowledge about how they work. Arcade claw machine games are similar, at least success-wise, to poker-style slot machines. Both require a deposit of some kind to play, and both require a little bit of skill and a lot of luck to come out on top. Sometimes you will win big, but more often than not you will walk away poorer than before with nothing at all to show for it. It is easy to forget—when playing these arcade claw machines—that someone actually owns and controls them. Regardless of how skilled you believe yourself to be at snatching these prizes with the mechanical claw, the truth is that the owners of these games dictate how often they want their claw machines to pay out—after all, it is a business for them. With the use of a setting called CMS, which stands for “command module setting,” the operator of a claw machine can dictate how often the game actually pays off. With this setting, operators can manipulate how many pounds per square inch (PSI) of pressure the claw will exert when grabbing a toy. In other words, sometimes the claw is at full strength, but more often than not it is made weaker with the help of the CMS. Most of the claw machines in arcades today utilize a pressure of 5 to 8 pounds per square inch, and require a minimum of 10 to 13 PSI to actually grab a toy successfully. These pressures are usually determined manually, and can be set by adjusting the tension spring that controls the claw’s strength. What Are Your (Usual) Odds of Winning at an Arcade Claw Machine? Based on the information you read above, you now know that arcade claw machine owners and operators can actually set up the game in such a way that it makes it impossible to win. And if that is the case, how is it that some people actually do win at the game from time to time? The answer: because state laws governing arcade gaming dictate how often claw machines MUST pay out. Generally speaking, most arcade claw machine games are designed in such a way that the claw is randomly and rarely (only once in many games) strong enough to actually grab and hold a toy long enough for the player to win. Some games even weaken in strength after a short time, giving rise to scenarios in which players get very close to victory just to see the toy slip from their grasp at the last millisecond (we have all been there). All of this information is a secret to most players, but since the manuals for many arcade games can be found online these facts are not difficult to verify. The rules on how often an arcade claw machine must “pay out”—use enough pressure to actually pick up a prize—vary from state to state. In the state of California, for example, arcade claw machine games must surrender a prize once in every 12 games, while in the state of Nevada the odds are even worse—once in every 15 games. That’s a lot of losses just for a chance to grab a small-value prize. Certain types of claw machines even have a default setting that determines the strength of the claw. One example of this is the Captain Claw crane machine, which assigns default win to loss odds of 1/18—once out of 18 tries that the claw will be strong enough to successfully pick up and deposit a prize in the chute. There are even some crane games that initially grip and lift a prize towards the chute, but then the claw begins to weaken as the game progresses and thus releases the toy just seconds before a player secures a victory. This has forced many an arcade player to the brink of the madness. Now that you understand that the odds are stacked against you when it comes to winning at arcade claw machine games, you might feel it best to just give up and put your efforts elsewhere. However, if you are like us, this information will only make you MORE eager to accept the challenge and beat the operators of these machines at their own game. After studying and understanding the various state regulations governing arcade claw machine games and the fact that operators control the odds of winning at specific crane games, we went out to an arcade and decided to put what we had learned to the test. Here is what we learned about the arcade claw machine game and how to win. The first and best way to ensure a win at the arcade claw machine is to watch and wait. Successful attempts relative to these games seem to come in cycles, and rarely does someone win twice in a row. In fact, your best bet is to stand near the machine while other players are attempting their luck with the crane and the claw. If, for example, you notice a player taking 10 turns at the game without getting a prize, this is an ideal time for you to try your luck. As you learned earlier, these games are programmed so the claw only has enough pressure to succeed in about one out of every 12 tries. So if a person before you has tried and failed for 9-10 times straight, your odds of winning a prize in the next few games increase dramatically. Along with playing the waiting game, you will also need to have a fair amount of alignment and skill to ensure you are selecting the “right prize” grabbing the toy correctly and moving it the right way. First, try to choose a claw machine in which the toy compartment is not totally full. In a packed machine the toys are very close together and that makes it more difficult to get a great grabbing angle on any one specific toy. You will also increase your odds of winning if you play the claw machine game with a partner. Using a partner, you can improve your grab angle by having him or her help you with the alignment of the claw, watching from the side of the machine to make sure the claw is in the ideal position. In other words, as you drive the claw, your partner essentially works as the navigator, giving you directional tips like “right” or “left” until the claw is in the perfect position to grab the toy. Try to decide on the most optimal toy to grab before you put your money into the machine. This way, you will not have to waste time searching for a target when the timer is running, thus giving you a better chance to align the claw correctly. Even though you may have your eye on a particular toy you want, that toy may not be accessible due to the other prizes surrounding it. 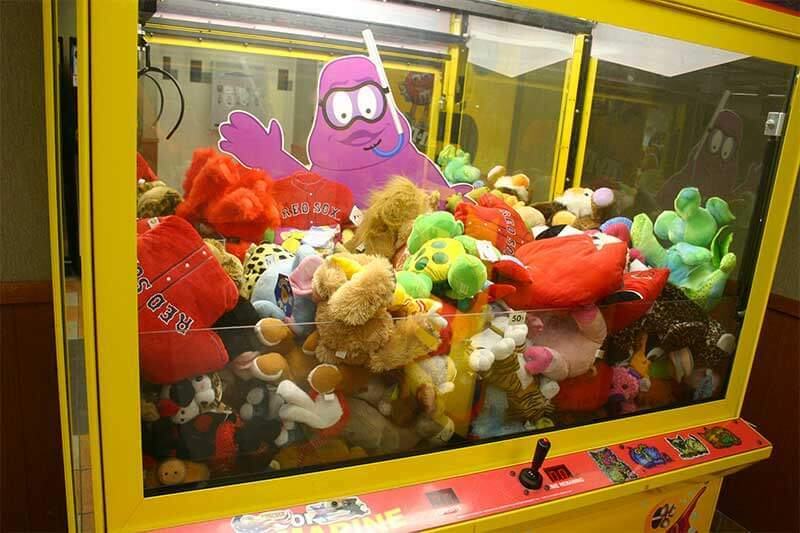 Make certain you select a toy that you can “totally” surround with the claw without hitting another prize. This will radically improve your odds of success. If no such target exists, allow other people to play the game for a while until that opportunity presents itself. The last and final tip for winning at arcade claw machine games is to use your time wisely. Remember, most games only allow you to maneuver the crane and the claw for roughly 15 seconds before the claw begins its descent. Thus, never spend more than 10 seconds maneuvering the claw over your target. You will need to use the final five seconds for the last minute positioning, which your partner on the side of the machine can help you with.